(Nanowerk News) In a recent study published in Nature Physics ("Brownian Carnot engine"), ICFO researchers Ignacio Martínez, Édgar Roldán, the late Dmitri Petrov and Raúl Rica, in collaboration with the Universidad Complutense de Madrid, have reported on the development of a microscopic motor operating between two thermal baths, that is, a micro Carnot engine. At the macroscopic level, a thermal engine is what makes car engines work, where a substance such as gas is compressed and expanded at different temperatures, converting thermal energy into mechanical energy, and thus, making the car move. Almost two centuries ago, the theoretical studies by Carnot set an upper bound to any thermal engine. Unfortunately, the so-called Carnot engine is a theoretical construction never tested experimentally. 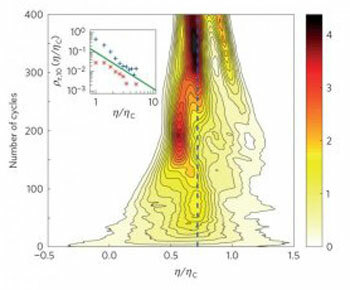 In their study, the researchers focused their efforts in creating a “microscopic engine” with the same properties as the Carnot engine, allowing the experimental validation of one of the milestones of Thermodynamics. Efficiency Fluctuations at maximum power. They created microscopic motors that work using a temperature difference, exactly as the engines in cars work, using the temperature difference between the hot gas inside the piston and the air outside. Instead of using a gas, they used a single particle and lasers and electrical fields in replacement of the cylinders, pistons and crankshafts, although the functioning process is essentially the same. They developed the microscopic heat engine by trapping a microparticle with a laser trap and tune the effective temperature of the particle via noisy electric fields, which increase the Brownian fluctuations of the trapped particle. Moreover, by modifying the laser power they were able to control the confinement of the particle in the trap, a sort of effective volume analogous to that of the gas inside the cylinder of a car engine. The simultaneous control over these two parameters following specific protocols established the cyclic operation that any kind of engine has, in particular those that define the Carnot cycle. Raúl Rica comments that “the technology developed at ICFO is unique and allows one to tune the temperature of the particle in a very precise way. This fine tuning is a must for the success of the experiment and, consequently, ICFO is one of the few places where our micromotor could be developed”. The results of this study have confirmed that it is possible to build systems that transform any temperature difference into useful work or electric power, no matter how big or small they are. Ignacio Martínez sees great future in its applications stating that “being able to understand “thermodynamics at the microscale" is a definite step forward towards comprehending how motors function within our cells. Knowing how these operate will allow us to design artificial nanomotors and apply them in state-of-the-art fields such as intelligent materials, artificial muscles, or even nanorobots”.